Technology Square, home of the Advanced Technology Development Center (ATDC) and an ecosystem of other industry- and startup-supporting centers, has some big new developments for this summer. Announced during its 2017 Startup Showcase, the ATDC is launching a retail initiative based on a $1 million donation to the Georgia Tech Foundation from the Mookerji Foundation. This retail initiative, modeled after a successful 2014 initiative that helped fund financial technology startups, will fund retail focused startups and hopes to attract young talent who will be innovative in the field. As customers continue to mix the modes through which they purchase goods from and interact with retailers, there is ample room for innovation and evolution in the sector. Another impending development for startups is the arrival of an independent venture fund, Engage Ventures, formed by a collaboration between several Fortune 500 and above corporations and Tech. Th e list of founding investors includes AT&T, Chick-fi l-A, Cox Enterprises, Delta Air Lines, Georgia-Pacific, Georgia Power Foundation, Inc., Intercontinental Exchange (ICE), Invesco Ltd., The Home Depot and UPS. Engage will invest in startups through a three-month accelerator- like program in which each accepted company will be given office space in Tech Square, $75,000 in base funding and industry connections through Engage’s company investors, whose leaders comprise much of Engage’s board. Engage Ventures will accept up to eight startups in each cohort, and is currently accepting applications nationwide for their inaugural cohort, whose program will run from Aug. 14 to Oct. 20, 2017. Th e major requirements are that a startup must already have a developed product or minimum viable product to apply, and participating startups must move to Atlanta for the duration of the program. “We leverage our partners to give our portfolio companies an unfair advantage and open doors faster within their organizations,” Olson said. Tech Square’s industry connections can also be seen through its corporate innovation centers, which are physical spaces where corporations can develop solutions by leveraging proximity and access to the Institute and its talented students. 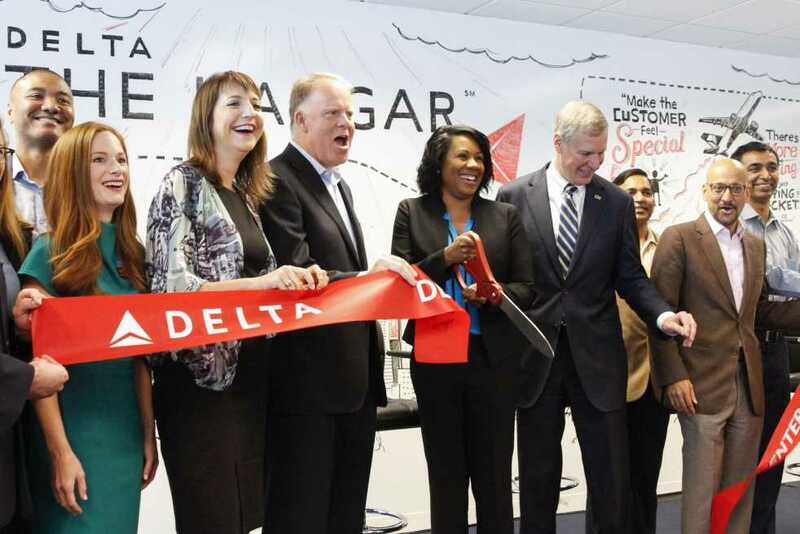 Delta recently opened its global innovation center, The Hangar, which had its ribbon-cutting opening ceremony on May 2, making Th e Hangar the newest innovation center. At the opening ceremony, Delta showcased new concepts and technology developed over the past year at the Hangar that could one day impact how customers order and receive food and drinks on-flight, or allow drone and autonomous vehicle technology to be integrated into Delta operations.